Product Description: Pleasant and easily digestible CHIPSI SUNSHINE PLUS Timothy, a valuable pla.. 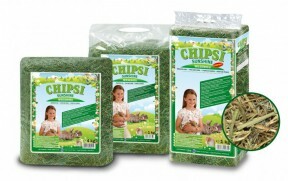 Your animals will love eating CHIPSI SUNSHINE meadow hay. CHIPSI SUNSHINE meadow hay contains all th..
Hay Ball for rodents The safe and easy way to feed different snacks in a hygienic way! There is a b..
Hay Roller for rodents A fun way to entertain your rodent while feeding. In addition, it is easy to..